Powers/Abilities: Hymir possesses the conventional attributes of the Giants of Jotunheim including superhuman strength (possibly Class 50), stamina, longevity and resistance to injury. It is unknown if his existence is dependant on cold temperatures as shown with the other giants. History: (Norse/German Myth) - Hymir is the father of the goddess Saga who gave birth to Tyr, the god of war, and son of Odin, Ruler of the gods of Asgard. Odin eventually realized that he needed use of a cauldron large enough to brew ale (beer) for the all the gods of Asgard. Tyr informed him that such a cauldron did exist. His grandfather, Hymir, the god of ale, owned it. Odin sent Tyr and Thor to retrieve the cauldron and the two of them were greeted warmly by Saga who then tried to hide them from her father. Hymir, however, discovered them and upon recognizing Tyr as his grandson, he also responded kindly to them. As Thor and Tyr tried to steal the cauldron, Hymir led the Frost Giants against them. As Tyr retreated with the cauldron, Thor summoned all his powers and drove them back than allowing them to enter Asgard. (Thor I#273 (fb) ) - Thor went fishing with an ox-head on the boat of the giant Hymir for the Midgard Serpent. Thor succeeded in catching the serpent, but Hymir grew afraid and cut the line believing he was saving Thor from himself. As the serpent retreated, Thor grew angry with Hymir and struck him. He then departed under the power of his hammer as he told Hymir he ought to be grateful that he was letting him live. 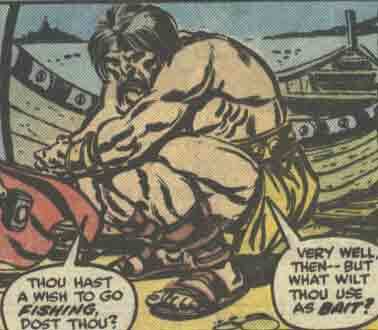 Thor and Hymir's fishing expedition was seen as a dream of Harris Hobbs' in Thor I#273. Hamir, the giant who helped Thor fish for the Midgard Serpent in Thor I#327, may have been intended to be Hymir. In Norse/German myth, Hymir is the name of the god Aegir in his role as the god of ale. However, there is no clear indication of whether this character is supposed to be or is meant to be the same as the god Aegir seen in Thor I #307. Considering his existence comes from the dreams of the mortal Harris Hobbes rather than the mouth of Thor, the concept of Hymir and Aegir being one and the same is possible, but unconfirmed. Hymir is supposed to be the father of Saga, the goddess of runes. Since there is some doubt of his connection to Aegir, it can be speculated that this Hymir may be the father of the Saga who appeared in Thor I#342. There are more comments to this convoluted family tree and how it might exist in the Marvel Universe in the Saga entry. Hymir supposedly died during the Ragnarok in Thor II#85.